Standard M4A2(76mm) Sherman with M1A1 gun and new 47° hull front. M4 Sherman tank design improvements. 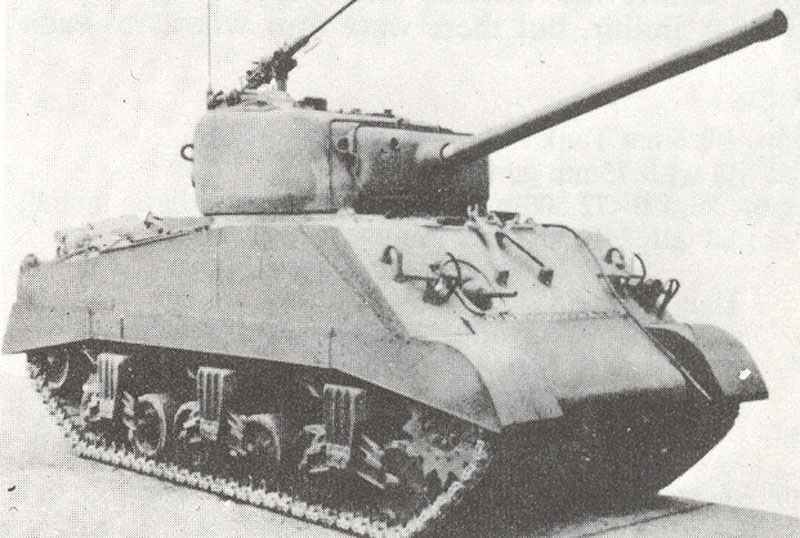 User experience led to numerous design improvements being suggested by the Armored Force and incorporated into M4 Sherman series vehicles by the Ordnance Department. Fore most among these were the need for a more powerful gun and better protection. To increase firepower the Ordnance Department developed the 76mm gun M1 and M1A1, starting in July 1942. Tests showed that the existing M4 series turret was too small to accommodate the extra length of this weapon and the turret of the T20/T23 medium tank was adopted and suitably modified. The 76mm gun installation was standardised and introduced in production lines from February 1944 and vehicles so fitted were available in time for the Normandy landings and subsequent combat in NW Europe. Suffix ‘(76mm)’ indicated vehicles with this gun. A modified 76mm gun M1A1C or M1A2 with muzzle-brake was later introduced. Fire hazard from hits in the engine, ammunition bins, and fuel tanks was the major shortcoming in the M4 series due to the relatively thin armour. Expedient measures to combat this were the addition of applique armour plates on hull sides adjacent to ammunition bins and fuel tanks, plus further applique armour welded on hull, and sometimes turret, front. Field modifications by crews included the use of sandbags on hull front and the welding of spare track shoes in vulnerable spots. In some instances large armour shields or concrete were added to hull fronts. Major design change to overcome the problem was the introduction of ‘wet stowage’ (glycerine-protected) ammunition racks in 76mm-armed and late 75mm-armed vehicles. Howitzer-armed vehicles had internal armour plates on ammunition racks. Miscellaneous: Other improvements included better electrical wiring, and other internal detail changes, a new 47° hull front to simplify production (it also improved frontal protection), larger access hatches for driver and co-driver, a loader’s hatch, and the provision of a vision cupola for the commander replacing the rotating hatch ring originally fitted. Users: USA, Britain, Canada, Australia, South Africa, France, Russia, China (for all series). Standard production M4A1 Sherman tank with ‘wet stowage’ and M1A1 76mm gun. M4A1(76mm) Sherman at Panzermuseum Munster, Germany. Side view M4A1(76mm) Sherman at Panzermuseum Munster, Germany. Russian Sherman (76mm) and T-34 tanks in front of the Austrian Alps in spring 1945. A column of Russian M4A2(76mm) Sherman tanks line the streets of Brno on 26 April 1945. Shermans were the single most common type of Allied tanks supplied to Russia, and played a prominent role in the 1944-45 fighting. Fuel consumption per 100 miles ? Secondary armament one .30 cal Browning MG coaxially to gun, one.30 cal Browning MG in front hull, together 6,250 rounds. Additional one .50 cal AA MG on Commander's cupola. Penetration 100 yds c.105 mm c.175 mm"
Tagged 1944, medium tank, usa. According to Steven Zaloga, the ultimate version of the M4 Sherman was the M4A3E8 with the 76mm gun with the improvements made by the Third Army (e.g. thicker armor as in the M4A3E2 and more widespread use of 76mm HVAP ammunition). Source: Steven Zaloga, Armored Champion: The Top Tanks of World War II, (Mechanicsburg: Stackpole Books, 2015), p. 289. Would you agree with Zaloga’s assessment?